Good morning. The year 2017 is a memorable year for us as we are celebrating the 20th anniversary of the establishment of the Hong Kong Special Administrative Region. 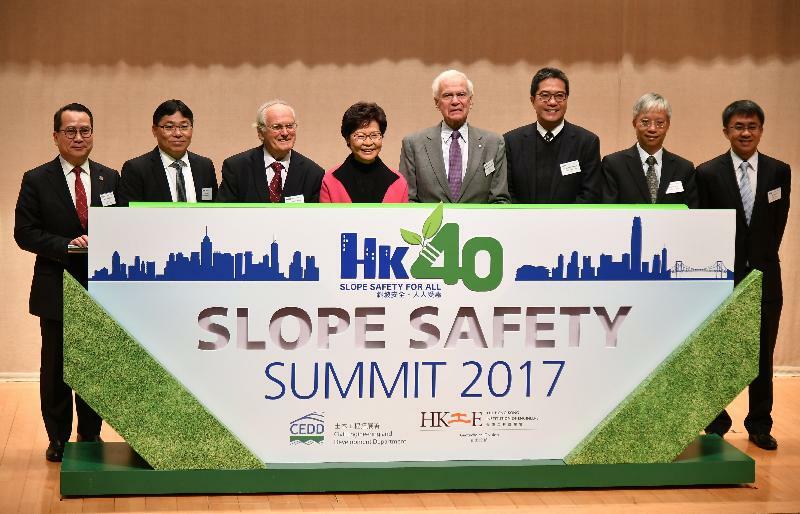 As festivities and celebration events are coming to a close, I am pleased to join you at this Slope Safety Summit today which marks the 40th anniversary of the Hong Kong slope safety system, notably with the setting up of the Geotechnical Engineering Office (GEO) 40 years ago. I wish to commend the Civil Engineering and Development Department for its initiative in hosting this summit together with the Hong Kong Institution of Engineers for us to reflect on our past successes and to prepare for the future. I wish in particular to welcome many distinguished experts who have contributed so much to our slope safety system over the years, including Professor Norbert Morgenstern, Professor John Burland, Dr Suzanne Lacasse and Professor Dave Petley. Each one of them has played critical roles in our GEO - both in terms of its establishment and its continuing evolution. Their geotechnical expertise and experience, their extraordinary commitment to slope safety, helped build the global city that Hong Kong has surely become over the past few decades. To be sure, it has been a long uphill - or should I say, downhill - struggle. Let's turn the clock back to some 50 years ago. Hong Kong's population soared from some 3 million in 1960 to more than 5 million in 1979. That population surge placed tremendous pressures on Hong Kong, particularly on our social welfare and housing systems. A number of tragic landslides, culminating in the Sau Mau Ping disaster of 1976, led to the establishment of an Independent Review Panel on Fill Slopes. Professor Morgenstern was a member of that trailblazing Review Panel. In a foreword to the Review Panel Report's later republication, he paints a poignant picture of that heart-rending time. Allow me to quote him here: "It is hard to recapture the sense of urgency that surrounded the preparation of this Report. At the time of the Sau Mau Ping disaster in 1976, Hong Kong was in the midst of an enormous public housing undertaking. The Sau Mau Ping landslide raised questions regarding public safety associated with this housing programme, and I still vividly remember Sir Murray MacLehose, then Governor of Hong Kong, asking, 'Do I have to evacuate several thousand people each time it rains?'" The answer was no, because that report prompted the birth, in 1977, of the Geotechnical Engineering Office - or the Geotechnical Control Office as it was initially called. For more than a decade, Professor Morgenstern also led the Slope Safety Technical Review Board. The Board was established in 1995 in the wake of the Kwun Lung Lau landslide of 1994 to advise Government on technical aspects of slope safety. In doing so, he helped bring to life the celebrated slope safety system we recognise with pride today. As for Dr Suzanne Lacasse and Professor Dave Petley, they are current members of the Technical Review Board, offering Hong Kong expert advice and valued international insight. I know that first-hand. As Secretary for Development from 2007 to 2012, I met with Suzanne every year, getting her invaluable advice on slope safety management. Indeed, as Secretary for Development, I supported the launching, in 2010, of the long-term Landslip Prevention and Mitigation Programme by the GEO. The Programme systematically tackles landslide risks linked to both man-made slopes and natural hillsides - both of which we have in perilous abundance. I still vividly remember that in the first couple of months of my taking up the position of the Secretary for Development, the then head of the GEO, Raymond Chan, came to see me presenting graphs after graphs to illustrate that while Hong Kong has done a lot in stabilising our man-made slopes, we must not lose sight of natural slopes, which are everywhere with our topography. Without asking any further questions, I gave policy support and secured the new resources for this programme which was rolled out in remarkable expediency. It is gratifying to note that this is an area where there is no room for complacency; the Government is still spending HK$1 billion every year on slope upgrading and mitigation works under the programme. 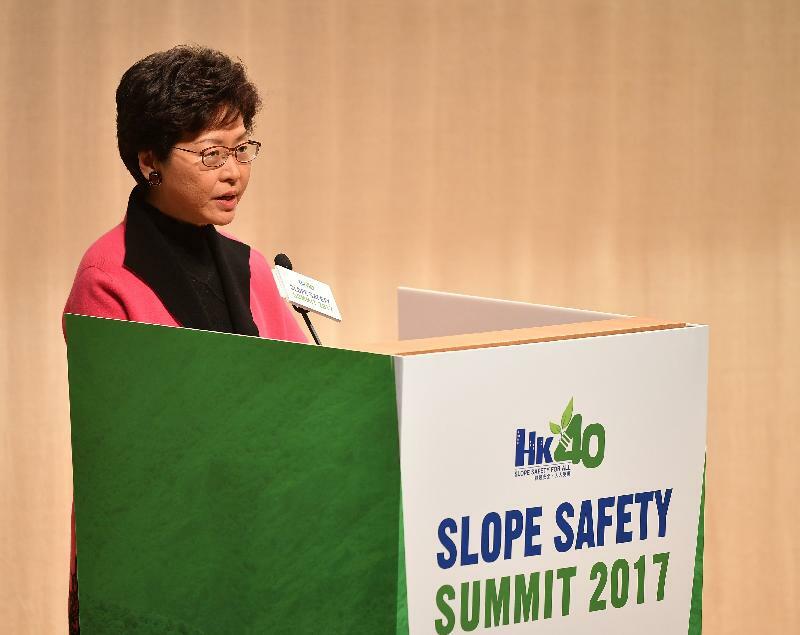 This morning, in my new capacity as Chief Executive of the Hong Kong Special Administrative Region, I'm here to applaud the extraordinary work you've all done over the years, and to reaffirm Government's commitment to maintaining the highest standards of slope safety in Hong Kong to protect people's life and property. There is much to applaud. Evolving in response to experience, continual improvement initiatives and technological advancement, we now have in place one of the best slope engineering and landslide risk-management systems in the world. Indeed, the risk of landslides from Hong Kong's man-made slopes today is down some 75 per cent from the 1977 level. But landslide risks will never drop to zero given that the majority of Hong Kong's land area is hilly terrain. Today, we must also contend with the acute challenges of population growth, slope degradation and, most notably, climate change. Climate change is already affecting us. And there is the very real likelihood that climate change will result in more frequent, more extreme rainfall, triggering deadly landslides from our mountainous landscape. Typhoon Hato, in August, highlights the impact of extreme weather. Hato, Hong Kong's first No. 10 typhoon signal since 2012, injured at least 129 people here. It felled some 5,300 trees and resulted in flooding and coastal-area damage. It was indeed a powerful reminder that we must be prepared to deal with extreme weather; that we must maintain the highest landslide vigilance. The Government has in place a Contingency Plan for Natural Disasters, created to ensure that we respond to emergency situations quickly and effectively across the whole of Hong Kong. In this, the GEO plays a vital part. It maintains a 24-hour, year-round landslide emergency service, advising government departments on action to be taken in case of landslide danger. I understand that, in recent years, they have been using sensors to detect landslides by monitoring changes in conditions of landslide-resisting barriers. This is a good example of how we embrace technology to achieve greater efficiencies in city operations, which is a key part in our ongoing quest to transform Hong Kong into a smart city. The GEO has also stepped up public awareness measures, producing a variety of publicity messages and educational activities promoting slope safety. This public awareness programme reaches into every sector of our community including schools. The exhibition outside this hall, organised under a "public education on slope safety" theme, makes a clear and compelling statement of our community-wide resolve. Ladies and gentlemen, today is a special occasion as we have here all the ex-leaders of the Geotechnical Engineering Office. You and your colleagues worked tirelessly in enhancing slope safety in Hong Kong. May I, at this point, invite all our heads, past and current, to rise for us to give them a big round of applause. You have been so successful that some of our younger generations who were born after the tragic landslides in the 1970s may now have taken slope safety for granted. But I will not. I know it is your vision and hard work which protect Hong Kong from landslides. You are truly the unsung heroes of Hong Kong. On behalf of the Hong Kong Special Administrative Region, I express my gratitude to you all. Before I close, I must say how pleased I am to see guests here from all over the world, including the Mainland, Thailand, Malaysia and other Southeast Asian countries. Such information exchange echoes the central role of connectivity in the Belt and Road Initiative. Hong Kong is most willing to share the wealth of knowledge and expertise that we have accumulated in combating landslides and in slope-safety management over the past decades with countries along the Belt and Road. Indeed, slope safety is a prerequisite to the infrastructure development that will drive the Belt and Road's future. My thanks, and gratitude, to the Geotechnical Engineering Office of our Civil Engineering and Development Department, along with the Hong Kong Institution of Engineers, for organising this most welcome event, this local and global gathering which brings together past and present, united in a future built on a smart, sustainable and safe Hong Kong. I wish you all a memorable Summit and a new year blessed with health, happiness and continuing success.